On November 2016, Bärenreiter Verlag published Bach's Cello Suites of "New Bach Edition, Revised Edition" (NBA rev. 4 / Editor: Andrew Talle). 1. 1st Suite, Prélude, from bar 33 to 36: lack of double stems. Of course, they must be played in double-stopping of open A-string and stopped a on the D-string. 2. 5th Suite, Allemande, bar 25, 1st bass note: it is not b♭, but g.
In the New Bach Edition (1988), Hans Eppstein wrote g correctly. Why was it changed into wrong note ??? The editor writes "the bizarre chord" (page XLIV), but we can see this chord in the other works of Bach. For example: The Well-Tempered Clavier, Book 2-3 C♯ major, Prelude bar 11, Book 2-16 G minor, Prelude bar 12, St. Matthew Passion, Finale bar 11, and Mass in B minor, Gloria bar 56, Quoniam, bar 14 and 91. 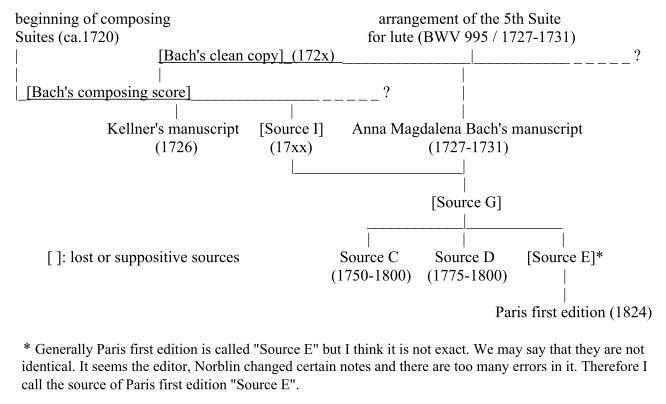 If Dr. Talle was the editor of these works of Bach, did he change their notes ? 3. 6th Suite, Prélude, bar 91, last note: it is g, not a. Bärenreiter must correct it immediately into this surprising, amazing, astonishing, beautiful, wonderful, excellent, incredible, remarkable, extraordinary 7th note. And I must add that Henle edition (2000) chose correct notes in these places. Why after 16 years, must we go back to the 20th century? This is the third edition as Bach Ausgabe (first edition 1879, second edition 1988 and third edition 2016). When at all can we see the double-stoppings of the 1st Suite Prélude ? 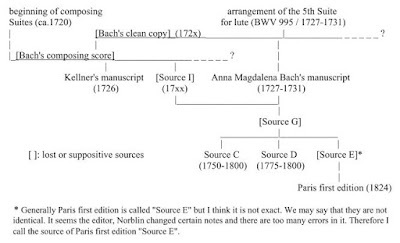 About the sources, the editor write some interesting things (for example, how Kellner has mistaken at the Menuet 1 of the 2nd Suite), but the most important thing about sources is Sources C and D (= Source G) are the descendents of Source A (Anna Magdalena Bach). 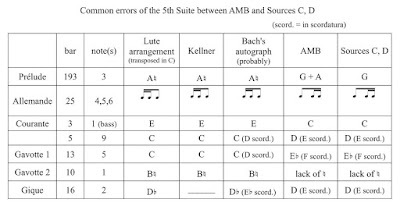 We find 17 common errors among Sources A, C and D.
I wonder why no Cello Suites researchers refer to these common errors. 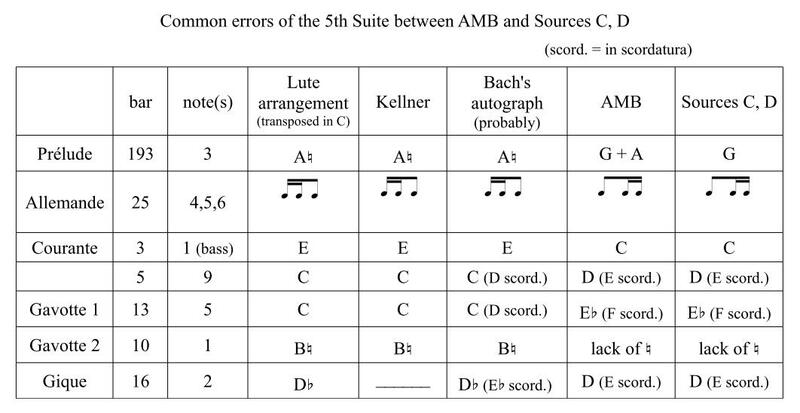 Unfortunately we don't have Bach's autograph of the Suites, therefore it need a some knowledge and sense of music for understand these errors, but fortunately, about the 5th Suite, we have Bach's autograph of his own arrangement for lute, so we can understand easily 7 common errors of the 5th Suite, and at these places Kellner (Source B) is the same as Lute arrangement (except last one; there are only first 9 bars in Gique). Allemande, bar 29, 10th note: f instead of d; it is not misprint but is in the Sources C and D, Paris First Edition and Dotzauer. I think it is simple error of Source G. If it was f, I think it needs g before. Allemande, bar 9, 3rd beat: lack of a on the upper voice. The editor indicate a as ossia in a footnote, but it is obvious that a in 16th note in the 2nd beat is an anticipation, so it requires another a as chord tone (diminished 7th) on the next beat. 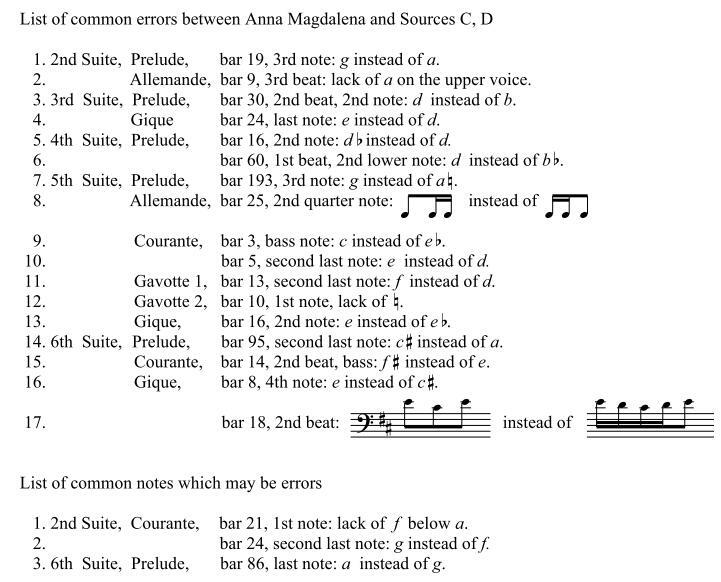 Gigue, bar 24, last note: the editor chose e according to Sources C and D, but I think it is Anna Magdalena's error. She wrote e and then rewrote d, but the copyist of Source G understood it was e. It is very unnatural as a passage note, because it consists a new chord (g-c-e) with precedent note (g). This case is very similar as the 5th Suite, Prélude, bar 193 (see bellow). is very good. I agree to all notes. See also Attention to the flats! Prélude, bar 170, 1st note: the editor refer to the possibility of a in a footnote; it is admirable but in truth, it is nothing except for a. And bar 193, 3rd note: it is of course a, there is no possibility of g.
Allemande, bar 25, 2nd 4th note: c-d-b is two 16th notes and a 8th note, not a 8th note and two 16th notes. Gigue, bar 16, 2nd note: it is d♭, not d♮. Sarabande, bar 31, 1st bass note: it is g♯ as Kellner wrote it, not g♮. 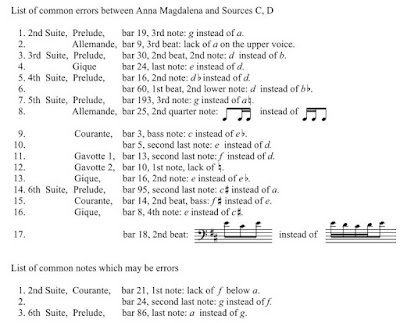 Gigue, bar 8, 4th note: it is c♯, not e. And bar 18, 2nd beat: e-c-e is probably Anna magdalena's error. For your comment on Suite 1, bar 29, you undoubtedly mean in the Allemande, not the Courante. Thank you Mr. Starkweather, I have corrected it. And thank you also for your videos about Bach's Cello Suites. I studied from them.